Scientists say we use only 5 -10% of our true strength. Yet that other 90 - 95% gets wasted, locked inside our minds. What if your could simply and easily unlock that strength in your very first session? What if you could continue to merge your mind and body together for a power that comes from within to shatter any previous limitation you used to think you had. Your mind is your shackle - limiting your physical, mental, and creative performance every day. It’s your throttle that holds you back in almost everything you do. But now you can finally unshackle yourself from the all limitations with the cutting-edge mind body techniques of CoreForce Energy. "Secrets of Freakish Strength Revealed"
These secrets of unstoppable strength and mental focus will improve every aspect of your physical training and being - and now they can be yours! My name is Garin Bader. I stand 6 feet tall and weigh in at weigh 204 lbs. - not exactly one of those petite Circque de Solei performers to be holding all my weight on two fingers, let alone to be pumping out rep after rep of straight-arm pushups on them. For sure, you might not want to do 2-finger pushups but IMAGINE being able to put that much focused strength and power into any sport you do! You're probably thinking right now that you could also never do these pushups on two fingers even if you tried. That's what I'm telling you, that's absolutely not true at all. I have helped thousands of clients apply this kind of power and focus. These pushups are simply proof of the power YOU too can use when your mind AND body joined together in the right ways with intense focus. And obviously you can see from my photo, you don't have to have gigantic steroid-loaded muscles to do so. I was thunderstruck when I first watched a video of Bruce Lee knocking a much larger man across the room with only a 1" punch as it was one of the fiercest demonstrations of astonishing explosive power I'd ever seen. And, I wanted to have that level of explosive strength and power too! Especially because I grew up as as a very skinny and physically awkward kid. Of course I realize not all of you are going to want to do two-finger pushups. 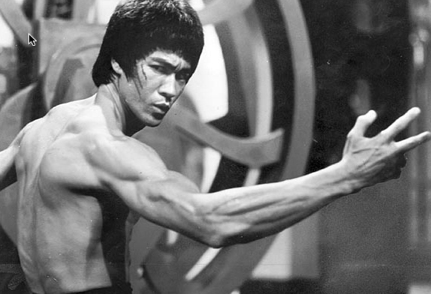 But imagine having the ability to focus all your mental and physical power into one small point like Bruce Lee could. Not only could he do two-finger punches but he used that same power of focus and extreme strength to knock even the largest, strongest man clear across room from the devastating force of his one-inch punch - even though he weighed only 140 lbs.! II knew this extreme power and raw muscular strength had to be generated from some other source than just muscles. But what was it? Where could I find it? These questions started me on my long search to discover the ultimate secrets of accessing our hidden powers to link mind and body together for total power. Unfortunately, I never was able to find the answers to these supreme secrets through all my years of martial arts training in many disciplines. I was met with years of disappointment while attempting to generate this legendary kind of Chi power that Bruce Lee possessed naturally. It was only after Years of relentless pursuit that I stumbled upon the first clues that began unlocking my ultimate human potential… breakthroughs which eventually turned into this revolutionary CoreForce Energy super strength training system. There are a lot of people who make promises that sound good in THEORY, but not in practicality. If you ask them to actually show you what they promise, they backpedal. I make bold claims. But I can also back them up. In fact, a little while ago I met a 15 year old boy who challenged me on everything I said. Over the course of a few minutes I covered every doubt he had. Power Question: "Can you do the Bruce Lee's famous 1 inch punch?" YES...Click Here to see a 1-inch punch! And you can do a 1 inch punch with what you learn inside CoreForce Energy. Sign up today. Bruce Lee Question: "Can you do 2 fingertip pushups like Bruce Lee?" YES...CLICK HERE to watch Garin Bader doing 2-finger pushups! 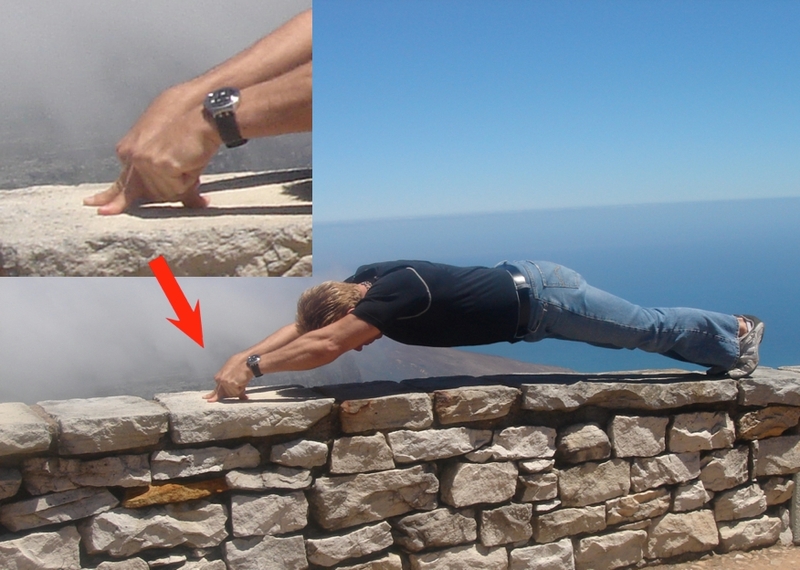 You will also be able to do 2 finger push ups with what you uncover with CoreForce Energy. I'll show you more in our FREE video training videos. Sign up on this page. Extreme Balance Question? "Can you PROVE you be knocked off balance and still have Matrix-like balance AND knockout power at the same time?" ANSWER: YES... watch me in action right here. 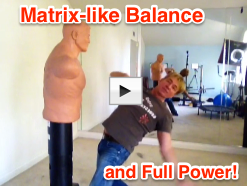 YES...CLICK HERE to Watch Matrix-Like Balance & Power. 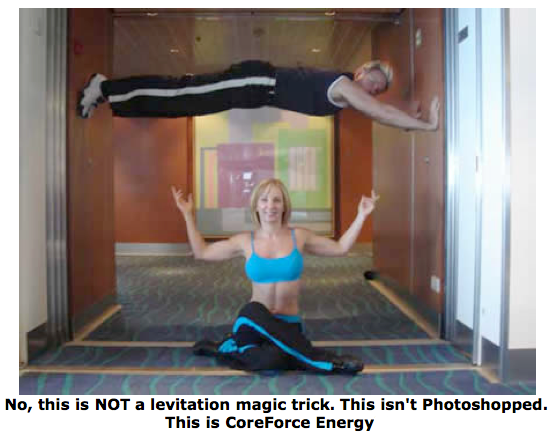 And YES, You can do this too - when you use what I show you with CoreForce Energy. Claim your free 4 Part Video series today and get CoreForce Energy Access for yourself. Power, and Abilities Within You Right Now? Think how exhilarating it would be to master a revolutionary system that supercharges your mind and muscles to work together congruently -- with a system powerful enough to double or even triple your muscular strength and speed - regardless of your athletic abilities, gender, or age. Whether you're a finely tuned athlete, a computer geek, weight lifter, a skinny wimp, martial artist, elite Combat vet, couch potato, or Soccer Mom - it doesn't matter, CoreForce Energy will unify your mind and body together for the maximum strength, power and speed of your personal human potential. CoreForce Energy is the human accelerant that unifies mind and body to create super strength and speed. Have you ever heard of a mother lifting a car to save her baby? Or someone ripping right through steel with their bare hands to save a friend in an accident? That's only a glimpse of the kind of superhuman strength that we have buried inside us. Just think of the things you could do if you could unlock and harness this kind of power consistently. Imagine if you knew the secrets to begin unleashing this kind of extreme power. Now you can... with CoreForce Energy. Reaches your ultimate physical potential no matter what your age, gender, or athletic background while increasing your muscle strength - FAST. Gives you "superhuman" strength and speed you can tap into, instantly, every day in every aspect of your life - this is truly a life transforming secret which gives you immense confidence because you always know the power is there inside you. Discovers your ultimate secret of instant power generation and ultimate “Chi” energy. Gains more strength in one day than you did in years of weightlifting or martial arts. ​Moves your body with remarkable speed and power in any situation. Enables you to enjoy 3-D strength so you have maximum power at any angle while remaining fluid and supple. This is something you won’t learn anywhere else. Unlocks your concentrated focus faster and for more power than the biggest weightlifting muscles could ever do for you. Flows your new power effortlessly without exhausting your muscles to failure - you'll still have energy to burn - shooting your stamina and endurance through the roof. Makes you phenomenally stronger without putting on an ounce of weight or developing massive muscles - but if you want massive muscles, this system enables you to build them faster and easier than ever before. Teaches you how to walk through your opponent as if he were a sheet of paper - no matter how bigger and stronger he is. Read and watch videos from high level black belts for yourself by clicking here. Gets you in shape FAST - without the usual long hours in the gym, tons of sweat, thousands of reps or fancy equipment to become stronger and faster. Harnesses the "Chi" Power elite martial artists, world champions, spec op warriors WISH they knew - This proprietary CoreForce Energy secret dramatically explodes your striking power and speed. Gives you possession of laser-like mental and physical focus that super athletes and geniuses access unconsciously to become brilliant and play at the highest levels. Shows you how to get Matrix-like balance and still be able to fire back punches and kicks with maximum power and speed even if you're off balance or have been knocked down by an opponent. Gives your body an armadillo coat of armor against injuries. Installs the mental edge through powerful mental imagery training for superior sports performance. Unlocks your vast reserves of your deepest creativity by fusing all your hemispheres of your brain together with your most empowering emotions so you tap into the very ingredients that geniuses like Da Vinci accessed on a daily basis. CoreForce Energy super strength training system is a universal energy system. Meaning you can apply CoreForce Energy techniques to ANY sport or exercise to accelerate your strength, speed, balance, endurance, agility, and power - AND, also many areas of your life. CoreForce Energy teaches you how to tap into the stores of hidden power laying dormant inside of you right now. Once you do this your power will be far greater than you've ever imagined. CoreForce Energy turbo-charges your ultimate powers in strength and speed because it simply fuses your Mind and Body together in a new way that's easy for anyone to grasp - optimizing the raw resources you already possess. It puts you in command of the astonishing untapped powers of your brain and muscles in a streamlined way that doesn't take years of training to achieve. It is indeed cutting-edge applied sports psychology combined with innovative speed strength training exercises. Ultimately CoreForce Energy gives you peak performance in every arena you apply it to. Your results will be incredible from your first session onward. This powerful strength system is designed to fully integrate and energize your optimal "Chi" or life force energy and musculature so that mastering it is intuitive, clear, concise, and can be easily learned by anyone - - no matter what your gender, age, or ability -- no matter if your left-brain or right-brain dominant. “When Garin Bader first told me about his CoreForce Energy, I was more than skeptical. To prove that he could teach me his method in a matter of minutes, he had me do a simple experiment. First, I exhausted my muscles by doing a number of different exercises. To test my strength level I then did some handstand pushups, but since I was physically wasted, I couldn’t do much at all; I felt very heavy and very weak. Next, Garin showed me just one simple CoreForce Energy concept that took only a couple minutes. To make sure my muscles didn’t recover, he had me do some more exercises before I retested on the handstand pushups; he wanted to make sure I was even more exhausted than before. When it was time to test my strength on the handstand pushups, I cranked them out like it was nothing. I couldn’t believe how easy they were to do, how strong I was, and how light I felt. I was shocked at the transformation. And I was surprised that it was so simple and quick to learn. NOTE: Read more raving reviews about CoreForce Energy by clicking here. By Incorporating Cutting-Edge ﻿Neuroscience﻿ and Breakthrough Peak Performance Training Techniques, Find Out How CoreForce Energy (CFE) ﻿Is﻿ Your Short-Cut To Supercharging Your Ability to Accelerate Mastery Skills, Strength, Mental Focus, Creativity for Anything you do! YES, Send Me These SECRETS & Tips!